Of all living creatures, none is more loyal and selfless than the seagull. A seagull is twice as loyal as a boa constrictor; and, it is fifty percent more selfless than a house cat. Plus, you can make swell puns with its name, like “gulls just want to have fun”. It’s closest relative, the tern, also lends itself readily to puns (e.g. : “…leaving no tern un-stoned”). The animal a seagull most resembles in behavior is the cockroach or rat. I don’t mean that in a bad way, but that’s pretty much the only way to interpret it. Gulls are cosmopolitan, which means they are EVERYWHERE! The only ways to avoid ever seeing one is to either blind yourself, or move to Neptune. I recommend moving to Neptune because the blind can still hear their awful discordant cries. Imagine the voice of the most shrewish woman you can conceive but in a language you don’t speak. That is the haunting call of the gull. A gulls natural diet is anything a person drops or cannot defend effectively. 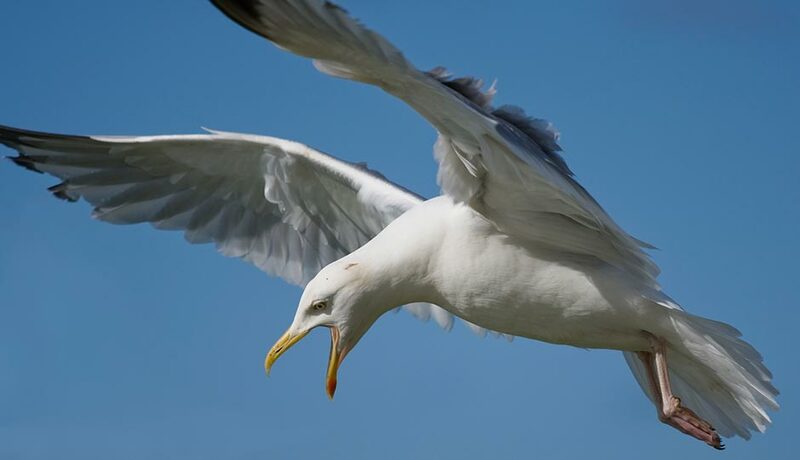 When garbage is not available, gulls eat any animal that doesn’t have the peripheral vision or common sense to see it coming: Fish, crabs, birthday party clowns, fruit, worms, eggs, lizards and mollusks. 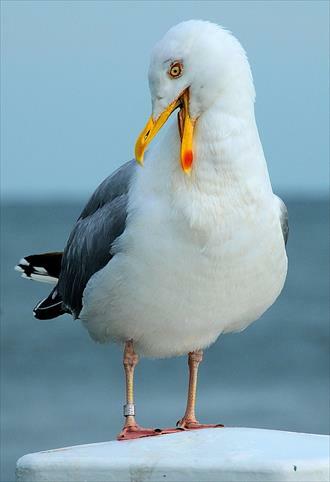 A gull can open clams and oysters by dropping them on rocks or rock-colored commuters. When you see them chasing a terrified toddler holding a bag of popcorn, you come to the realization that the concept of scavenging is kind of lost on them. It ISN’T scavenging when the previous owner is still clutching it. Gulls often follow ocean predators to feed on the smaller fish that break the surface to escape the underwater predator. Scientists agree that the look of surprise on the fish’s face is PRICELESS. Seagulls are monogamous; this is hardly a surprise because if you screeched all of the time and your breath smelled like carp and cigarette butts, you’d probably settle for whoever would take you. The bound pair can even distinguish each other’s call from out of hundreds. The male stands in the middle of a thousand birds waiting for that shrill voice that makes his buttocks clench and his testicles pull up into his body cavity. [As you can see, I have a LOT of issues]. Males and females build their nest, together. The male never gets it the way the female likes it, but they are pair bound for life, so neither really gives a crap anymore. In Anton Chekhov’s The Seagull, a dead seagull is used as a theme, a metaphor AND foreshadowing… it is the most use anyone has ever gotten from a seagull. Sabine’s Gull is an arctic bird that migrates south in the fall. It returns to the Arctic right about the time that those down south start getting tired of their nonsense. They are gray-winged with a white body. This gull was named after its discoverer, Edward Sabine, who also has two islands, a mountain and a moon crater with his name. Judging from his photograph, he was the kind of a guy who enjoyed evicting orphans and unwed mothers from their homes; but, to be fair, everybody’s photograph had that feel to it in the nineteenth century. Gull fossils go back thirty million years… although, in a pinch, I’m sure you could make a fresh one. What they ate before they had homo sapians to swarm around is still a mystery….